What do twenty-seven classic cars, a dancing bear pickpocket and a millionaire in Big Sur have in common? They are all in this book, part of Joe Gores’ DKA [Daniel Kerney & Associates] series. It should be no news to anyone that I like what Joe Gores writes. I find his PI procedurals very entertaining indeed, with good characterization and realistic scenarios, which isn’t surprising considering Gores’ background as a PI himself. This one picks up where 32 Cadillacs ended and carries the story forward. One thing that adds a special treat in this particular DKA is that I’m in it, as a very unlikable villain. But modesty keeps me from pointing that out. The culture of the gypsy clans continues to fascinate Gores and I find it fascinating as well. The scams run are clever and believable. I enjoyed this and though it’s not my very favorite DKA, they’re all pretty darn good, this one included. This entry was posted in Friday Forgotten Book, mystery. Bookmark the permalink. You know, I remember 32 CADILLACS very well but can’t remember whether or not I read this one. As a real fan of Gores and DKA I must have, right? But I just checked my database (granted, the one on the laptop is several years outdated and it isn’t on there. I will have to get a copy as soon as I get home, if my full list proves I haven’t read it. So this was a productive review for me! Haven’t read his work but sounds like I should give it a try. Jeff, wouldn’t you have remembered one in which the villain was Richard Robinson? Maybe? Charles, I don’t say this to you about a lot of mystery fiction, but this is an author I think you’d enjoy. 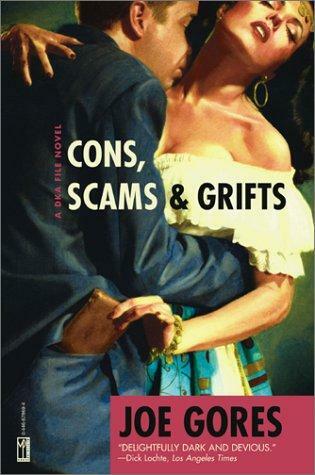 I read 32 CADILLACS (and enjoyed it) but I never got around to reading CONS, SCAMS & CONS. I’ll have to remedy that. Nice review! Thanks, George. I like just about everything Gores has written. Who would ever have thought that in this day and age Gypsies would make such a great subject for a series of private eye novels and stories? Thanks of the review, Gyppo. John. two Gores review on one Friday Forgotten post day, how very cool. Welcome aboard. Thanks! Hey, why not give everyone a surprise and show them the back cover of the book and how it reflects the front? I probably would have remembered, Rick. I definitely didn’t read it. Richard, the author and the series are both new to me. I like reading a good police or PI procedural, especially one that is as entertaining as this series is. Can you! want something super new? Look at this site. Only here the choice of slaves for every desire and completely free! They are good slaves, they will and want perform anything you command !